The Fellowship was fortunate enough to obtain a copy of ACTIONVERSE FEATURING THE F1RST HERO #1 from Action Lab Entertainment. The story is by Anthony Ruttgaizer, with art by Marco Renna, colors and letters by Fred C. Stresing. Kyle Scordato is trying to get back to his Earth. But he encounters other Earths along the way, only increasing his rage and his desperation to get home. He jumps onto the Earth where Jake Roth is the only superhero in existence. Jake’s power is what Kyle needs to make another jump. With his “assistance” they arrive on another Earth, but who is there to greet them? I’ll be honest; I’ve been waiting for this book to come out. Ruttgaizer and Renna have created an intriguing start of what could be a thrilling and action-packed event. You can understand Kyle’s need to get home, but the means to jump universes is SO messed up. Ready to see Molly Danger, Midnight Tiger, Stray, and Virtue get involved. Won't be a long wait as this is a weekly series; the next issue is seven days away! 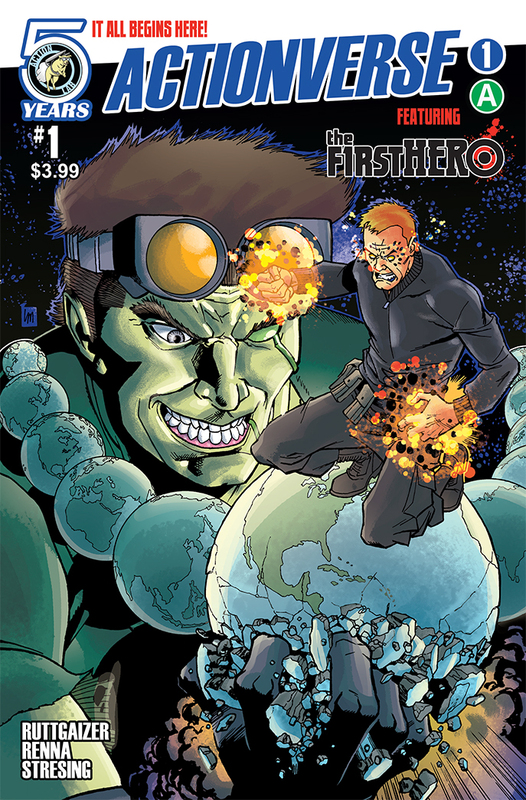 ACTIONVERSE FEATURING THE F1RST HERO #1 is in stores now, or available for ordering at www.actionlabcomics.com.